"There's still risk it could all blow up"
AIG's CEO tells Congress that without the bonuses, financial disaster looms. Congress is unpersuaded. AIG CEO Edward Liddy testifies before the House Financial Services Subcommittee on Capital Markets, Insurance, and Government Sponsored Enterprises on March 18, 2009. 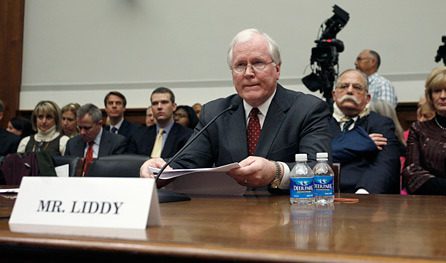 Edward Liddy, the CEO of AIG, testifying live and under oath before Congress, reluctantly defended the "distasteful" practice of awarding retention bonuses to executives of AIG's Financial Products division, using the same excuse that both Bush and Obama administration officials have employed in defense of Wall Street bailouts: The potential damage would be even worse if we didn't do anything. "I am trying to desperately prevent an uncontrolled collapse of the business," said Liddy, who was brought out of retirement six months ago to run AIG. "Mistakes were made at AIG on the scale few could have imagined possible," said Liddy, specifically referring to the the buildup of a $2.7 trillion portfolio of credit default swaps and other derivative products. About $1 trillion worth of that portfolio has been "wound down," said Liddy, but AIG is still on the hook for an unthinkable $1.6 trillion worth of liabilities. "There is still risk that that could blow up," said Liddy, and it was clear from his expression that the prospect was not a rhetorical exercise. Liddy didn't need to further connect the dots. If AIG F.P. 's outstanding portfolio of derivative products "blows up" -- the cascade could likely bring down AIG's counterparties. Which would inevitably require the expenditure of further government trillions to prevent a systemic crash. To which Paul Kanjorski, D-Pa., the chairman of the subcommittee, responded with a Catch-22 -- the political furor over the bonuses is making it extremely unlikely that Congress will authorize any further money to bail out AIG or any other Wall Street financial institution. You have to love -- or hate -- the beauty of this showdown. The CEO of AIG tells Congress that giving out bonuses is necessary in order to prevent a financial cascade of destruction that could bring down the economy. And Congress tells the CEO of AIG that giving out the bonuses ensures that Congress will not authorize any more funds to mitigate exactly that disaster.